Ashton Durrand Sanders (born October 24, 1995) is an American actor. He is best known for his portrayal of Teen Chiron in the Academy Award-winning film Moonlight (2016). Sanders was born in Carson, California. He attended Grand Arts High School in Downtown Los Angeles, from which he graduated in 2013. He was studying towards a BFA at the Theatre School at DePaul University, before dropping out in 2016 to focus on his acting career. Sanders made his film debut in The Retrieval, directed by Chris Eska. The film had its world premiere at South by Southwest on March 11, 2013. It was released in a limited release on April 2, 2014 by Variance Films. In 2015, Sanders had a small role in Straight Outta Compton. In 2016, he appeared in an episode of Refinery29's web series The Skinny. The same year, Sanders appeared in the drama film Moonlight, directed by Barry Jenkins. The film had its world premiere at the Telluride Film Festival on September 2, 2016, and began a limited release on October 21, 2016 by A24. Moonlight received massive critical acclaim as well dozens of accolades, including the Golden Globe Award for Best Picture – Drama. The film also won three Academy Awards for Best Picture, Best Adapted Screenplay, and Best Supporting Actor for Mahershala Ali. Sanders' role in the film was praised by critics; Benjamin Lee of The Guardian called his performance "powerful". Sanders co-starred in The Equalizer 2, a sequel to the hit action film The Equalizer, opposite Denzel Washington. In 2019, Sanders starred in Rupert Wyatt's science fiction thriller film Captive State, opposite John Goodman and Vera Farmiga. He also played the lead in HBO's adaptation of the novel Native Son. 2016 The Skinny Tyler Episode: "Squad"
^ "Ashton Durrand Sanders (@ashtondsanders) • Instagram photos and videos". www.instagram.com. ^ Robehmed, Natalie (January 6, 2017). "Meet Ashton Sanders, Star Of 'Moonlight' And 30 Under 30 Honoree". Forbes. ^ Duncan, Fiona. "ASHTON SANDERS". Wonderland Magazine. Retrieved September 18, 2018. ^ Cuby, Michael. ""Moonlight"'s Ashton Sanders Opens Up About Being Bullied". Teen Vogue. Retrieved March 6, 2017. ^ Harris, Brandon (April 3, 2014). "Battle Cry: Chris Eska on The Retrieval". Filmmaker Magazine. Retrieved October 24, 2016. ^ "The Retrieval". South by Southwest. Retrieved October 24, 2016. ^ McNary, Dave (February 13, 2014). "SXSW Winner 'The Retrieval' Gets US Distribution". Variety. Retrieved October 24, 2016. ^ "The Retrieval". Apple Trailers. Retrieved October 24, 2016. ^ Phillips, Michael (September 15, 2016). "'Moonlight' reveals struggles of a young African-American man". Chicago Tribune. Retrieved October 24, 2016. ^ "The Skinny". Refinery29. Retrieved October 24, 2016. ^ McNary, Dave (October 21, 2015). "Naomie Harris, Andre Holland, Mahershala Ali to Star in 'Moonlight'". Variety. Retrieved October 24, 2016. ^ Hammond, Pete (September 1, 2016). "Telluride Film Festival Lineup: 'Sully', 'La La Land', 'Arrival', 'Bleed For This' & More". Deadline Hollywood. Retrieved October 24, 2016. ^ D'Alessandro, Anthony (June 28, 2016). "A24 Sets Dates For 'Moonlight' & Cannes Jury Prize Winner 'American Honey'". Deadline Hollywood. Retrieved October 24, 2016. ^ "Meet 'Moonlight' Star Ashton Sanders". EW.com. Retrieved January 9, 2018. ^ Lee, Benjamin (April 22, 2017). "Moonlight's Ashton Sanders: 'America isn't made for the black man'". The Guardian. ISSN 0261-3077. Retrieved January 9, 2018. ^ Jr, Mike Fleming (August 24, 2017). "'Moonlight's Ashton Sanders Lands A Lead In 'Equalizer 2'". Deadline Hollywood. Retrieved January 9, 2018. 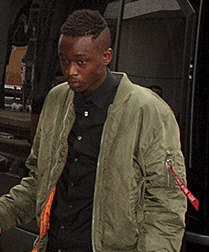 ^ "'Moonlight' Breakout Ashton Sanders Joins John Goodman in 'Captive State' (Exclusive)". The Hollywood Reporter. Retrieved January 9, 2018. This page was last edited on 4 April 2019, at 15:07 (UTC).